Deck out your ride in style with this officially licensed seat cover! Each seat cover is made out of a durable poly-velour material and features an embroidered team logo. 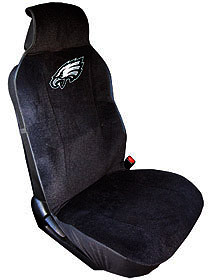 The seat cover is stain resistant and fits most seats with adjustable head rests. Heavy duty security clips and easy to install instructions are included. Only Ground service available for this warehouse.